2010 Blog Bicycling Classical Greece | ExperiencePlus! In October of 2010 June Wheeler and her partner Peter Herzog joined ExperiencePlus! to Bicycle Across Classical Greece from Athens to Olympia. June kept a blog with wonderful stories and photos throughout the trip. We are very excited that she has graciously agreed to allow us to share their trip with you. 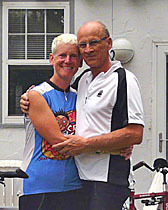 June and Peter live in St. Paul, Minnesota and started bike touring in 1996 as a result of knee injury rehabilitation (June) and purely non-competitive enjoyment (Peter). They have just signed up for their 7th ExperiencePlus! tour (Cycling Assisi and the Best of Southern Tuscany Plus! Florence – September 2011) and tell us that they are very excited at the prospect of great food, great wine and great biking. Their most epic and memorable bike tour was in 2005, when they set off solo and self-guided from St. Paul and biked 1400 miles in 23 days to New Haven, CT to attend June’s 25th college reunion. When not on their bikes, June enjoys riding her horse Bjorne and training her dog Bess in agility, as well as coaching lacrosse goalies at the high school and college level. Peter enjoys photography, watercolor painting and sketching, which he pursues avidly during bike tours to capture the soul and essence of the wonderful places they have visited. Read their blog Bicycling Classical Greece from Athens to Olympia and then have a look at the new and improved 2011 itinerary that includes a 2 night stay and cooking class in one of our favorite towns, Kalavrita. There is still opportunity for you to join us October 3 – 13, 2011 for your own special journey across the Peloponnese.